I have been attracted to your work many times before and am touched you should wish me to write my response and hope my lines coincide or expand with your thoughts and work. I have seen in your previous work craft materials and techniques pass through your fingers making art that engages my mind and senses. 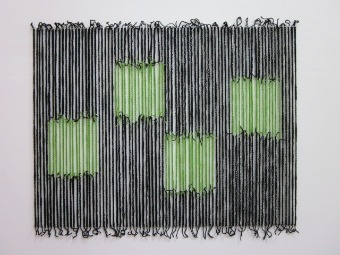 I am making your 4 Green Woolie Squares(2010) on my kitchen wall. Installing each bundled unit lead to involving myself, on a smaller scale, in mimicking your process by individually attending to each thread-line of woolen yarn looped in crochet chain. 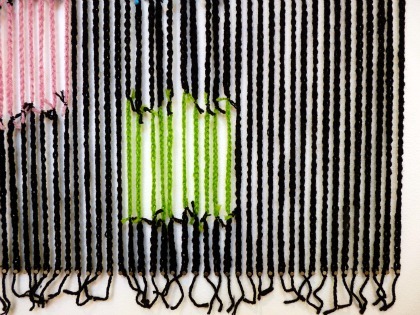 On graph paper a design with four green squares set in black is a simple idea but when translated to wooly yarn looped and knotted makes something more than its visible parts and accommodates various spontaneous responses. Paul Klee arrives in my mind for the way he encouraged a line in drawing to perform all the actions you do with thread to loop, knit, knot and weave. Hung from nails equally spaced across a wall it became pattern and here what intrigues me is when pattern becomes form. The natural language of pattern and form is mathematical, small units come together and interact, these units don’t have to be identical or repeat regularly. We perceive them generally as patterns expanding into space and over time, form is a more individual affair. Combining colour with black helps to contain colour, absorb its energy and yet allows colour to stand out. The green rather than square shapes made a greater impression, calling out an apple roundness and then traveled into my colour memory for a similar green. A green made fertile in the skirt worn by Giovanna Cenami in ‘The Arnolfini Marriage’ by Jan van Eyck painted in 1434. The history of green in painting and our culture show a colour transformed and is another story. 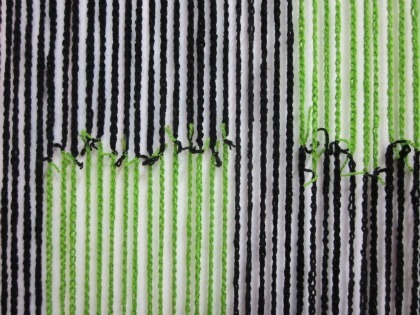 The is work now installed on the wall that acts as a light background to wool looped and knotted threads, together these features soften all the edges between green and black. In becoming irregular this work slips away from the geometric organizing structure. The irregular softened edges and variations in length show the hands tension and produce differences in the green squares proximity and relationship to each other. Squares on graph paper become green cubes under the influence of material and technique moving through your fingers thus bringing together the spatial qualities that makes the work dynamic. 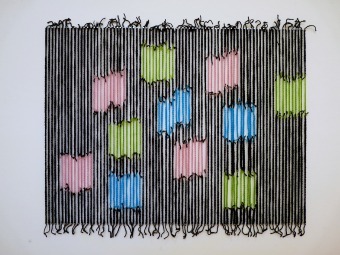 There are other parallels I am stimulated to connect to your work because of the repetition of geometric shapes, a certain kind of patterning and recurring structures point toward abstraction. If I take other definitions to abstraction they would also lead to your work. As well your use of materials and techniques relate to the creative pursuits of women and in the basket of crafts highlight a separation created by Modernism through specialization and categories of material attributed to particular disciplines. But rather I found it is the reality of materials and techniques employed that make this work something more and abstract. What makes the things you make into art, is in the way they play with our concepts and perception and go beyond appearances. And find the full quote, as it is apt for the experience I have received.